The liver contains abundant cytotoxic cells, including NK-T cells, NK cells, and CTLs. However, the regulation of this cytotoxicity is not fully understood. In this study, we investigated the effect of a recently described cytokine, IL-18, which is present in large quantities in the liver, on the cytotoxicity of intrahepatic lymphocyte subpopulations. This effect of IL-18 was assessed by assaying the in vitro cytotoxicity of purified NK-T, NK, and T cells against a CD95- and perforin-sensitive T cell line, Jurkat. The results show that IL-18 enhances the killing activity of liver NK-T cells by a CD95-independent, perforin-dependent pathway. IL-18 also augments liver NK cell activity, but the exact mechanisms of this killing remain to be elucidated. Finally, the augmentation of the killing activities of liver NK-T and NK cells by IL-18 is not due to soluble TNF-α, because none of these cell populations had detectable TNF-α production. The activation of T cells by superantigen (1, 2, 3), TCR-specific peptide (4, 5), and nonspecific stimulation by anti-CD3 Ab (6) results in the deletion of activated T cells from peripheral lymphoid organs. This activation-induced cell death (AICD)3 is important for maintaining the normal immune response and immune tolerance. Abnormalities in this process may lead to a failure to eliminate T lymphocytes after they respond to Ag and to eliminate autoreactive lymphocytes, thus resulting in autoimmune diseases (7). In vivo studies using different TCR transgenic (tg) mouse models have demonstrated that CD95 and TNF have partially redundant roles in the deletion of activated CD4+ T cells in lymphoid organs (8, 9). In contrast to information regarding the mechanisms of CD4+ T cell deletion, little is known about AICD in CD8+ T cells. In the previous study, we used a TCR tg mouse line recognizing SV40 T large Ag that was presented by the KK MHC class I molecule to shown that the injection of a specific peptide causes a massive peripheral deletion of CD8+ T cells. Interestingly, no apoptosis was observed in the lymph nodes or spleens, but CD8+ T cells disappeared from the circulating pool and accumulated transiently in the liver, where they underwent apoptosis (4). This observation has led to the conclusion that the liver is a specific site for the activation-induced apoptosis of CD8+ T cells. Compared with peripheral lymphoid organs, the liver has a unique anatomical environment that may be closely associated with its immunologic function. In addition to the presence of large quantities of resident macrophages (Kupffer cells), the liver contains conventional T cells, NK cells, and especially NK-T cells at high frequency (10, 11). These subpopulations have cytotoxicity against virus-infected hepatocytes or tumor cells via CD95-dependent or perforin-dependent pathways (12, 13, 14); these pathways are predominant mechanisms of cell-mediated cytotoxicity. The cytotoxicity of these cells can be augmented by cytokines such as IL-2 and IL-12, which have an important role in antitumor immunity (13, 14, 15). However, the immunoregulatory role of these cytotoxic cells remains largely undefined. Recently, a novel cytokine, IL-18 has been identified and cloned from cDNA extracted from the liver. This cytokine is produced by Kupffer cells and has been shown to be a potent inducer of IFN-γ production by T cells and a costimulatory factor for T cell activation (16, 17). In addition, IL-18 augments NK cell activity in the spleen and the liver (16, 13) as well as the cytotoxicity of Th1 cells (18), suggesting that its role may be to regulate cytotoxicity. This evidence prompted us to hypothesize that IL-18 may augment the killing activity of intrahepatic cytotoxic cells during an immune response. In the present study, we first tested whether IL-18 augments the cytotoxicity of intrahepatic lymphocyte (IHL) subpopulations using an in vitro model and found that IL-18 does indeed augment the killing activity of different IHL subpopulations. In addition, the dependence of cytotoxicity on CD95 or perforin was investigated in CD95 ligand (CD95L)-deficient and perforin-deficient IHL subpopulations. The implication of this observation in immunoregulation, particularly in intrahepatic T cell deletion, is discussed here. C57BL/6 (B6) and C57BL/6.C3Hgld/gld (gld) mice were obtained from The Jackson Laboratory (Bar Harbor, ME). Perforin-deficient (C57BL/6 × 129/SvEv, pfp KO) mice were purchased from Taconic (Germantown, NY). The mice were maintained in the Immunobiology Mouse Unit animal unit at Yale Medical School and were used once they reached 8 to 12 wk of age. Collagenase IV, DNase, and metrizamide were purchased from Sigma (St. Louis, MO). Phycoerythrin-anti-NK1.1 Ab and CyChrome-anti-mouse TCRαβ Ab were obtained from PharMingen (San Diego, CA). Murine IL-18 was kindly provided by Dr. Haruki Okamura (Hyogo College of Medicine, Nishinomiya, Japan and Hayashibara Biochemical Laboratories (Okayama, Japan). An ELISA kit for murine TNF-α was purchased from Endogen (Woburn, MA). IHLs were isolated by perfusion via the portal vein with 5 ml of Bruffs medium containing 0.2 mg/ml collagenase, 0.02 mg/ml DNase, and 5% FCS (digestion buffer). After perfusion, we homogenized the livers by forcing them through a metal strainer; the livers were then digested with 10 ml of digestion buffer at 37°C for 45 min. The majority of the hepatocytes were removed by centrifugation at 30 × g for 3 min. The supernatant was centrifuged at 650 × g for 10 min to obtain a pellet of nonparenchymal cells. The pellet from each liver was suspended with Bruffs medium to a final volume of 1 ml before mixing with 4 ml of 30% metrizamide in PBS. The cell suspension in metrizamide was underlaid with serum-free Bruffs medium and centrifuged at 1500 × g for 20 min. The cells at the interface were collected, washed with PBS, and counted. To isolate NK cells, NK-T cells, and conventional T cells, total IHLs were stained with phycoerythrin-anti-NK1.1 and CyChrome-anti-mouse TCRαβ Abs and then sorted into NK1.1+,TCRαβ+ (NK-T cells); NK1.1+,TCRαβ− (NK cells); or NK1.1−,TCRαβ+ (conventional T cells) using a FACStarplus (Becton Dickinson, Mountain View, CA). Similarly, spleen cells were sorted into TCRαβ+ cells after staining the TCRαβ+ cells with CyChrome-anti-mouse TCRαβ Ab. The purity of the sorted cells was always >98%. Varying numbers of effector cells were stimulated with IL-18 at a concentration of 50 ng/ml in the presence of immobilized anti-mouse CD3 Ab (5 μg/ml) in a volume of 100 μl for 3 days. In the case of NK cells, the induction of cytotoxicity was performed by culturing cells alone or with IL-18 for 2 days. Cells from the human T leukemia cell line, Jurkat, or the mouse lymphoma cell line, YAC-, were labeled with Na251CrO4 (51Cr) for 1 h at 37°C, washed three times, and resuspended in 5 × 104 cells/ml. A total of 100 μl of target cells were added to the effector cells and incubated for 4 h. The percentage of specific Na251CrO4 release was calculated as described previously (13). All cytotoxicity assays were performed in 96-well U-bottom microplates (Falcon, Becton Dickinson Labware, Franklin Lakes, NJ), and all cultures were set up in duplicate. IHL subpopulations were stimulated with anti-CD3 Ab in the presence or absence of IL-18 as described above. The supernatant was collected, and the production of TNF-α and IFN-γ was measured using an ELISA kit for murine TNF-α or IFN-γ. To investigate whether IL-18 has any effect on the cytotoxicity of liver killer cells, total IHLs were isolated from wild-type B6 mice and stimulated with immobilized anti-CD3 Ab alone or in combination with IL-18 for 3 days. The cytotoxicity was determined on a human T cell line, Jurkat, which is widely used as a target for CD95-mediated cytotoxicity in both human and murine systems. 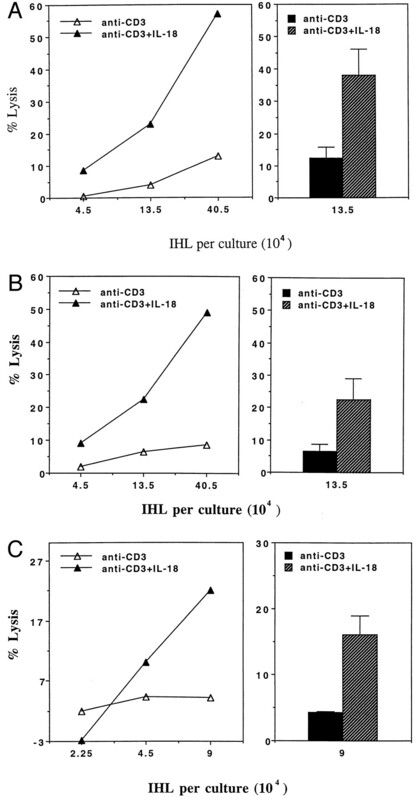 As shown in Figure 1⇓A, IHLs from B6 mice that had been stimulated with anti-CD3 Ab alone were cytotoxic against Jurkat cells only at a high number of responding cells (4.5 × 104 cells/culture); however, increased killing activity was observed after stimulation of the cells with anti-CD3 Ab plus IL-18. To test whether this cytotoxic effect was due to a CD95-CD95L interaction, we performed the same experiments on IHLs from gld mice, which are mutants for CD95L. The cytotoxicity of IHLs from gld mice was enhanced by IL-18 to an extent that was similar to what we observed for B6 mice (Fig. 1⇓B), showing the existence of a CD95-independent killing mechanism. In addition to the CD95-mediated cytotoxicity, the other predominant cytotoxic effector mechanism was perforin stored in cytoplasmic granules. Therefore, we subsequently addressed whether IL-18 can augment the cytotoxicity of IHLs via a perforin-mediated pathway. This possibility was tested by assaying the cytotoxicity of IHLs from perforin-deficient mice. The results show that the cytotoxicity of IHLs from this strain was significantly increased by stimulating cells with IL-18 (Fig. 1⇓C). Therefore, we conclude that IL-18 enhances the cytotoxicity of IHLs. However, this increased cytotoxicity was not simply due to a single mechanism mediated by either CD95L or perforin. Augmentation of the cytotoxicity of IHLs by IL-18. Total IHLs from B6 (A), gld (B), and perforin-deficient (C) mice were stimulated with or without IL-18 (50 ng/ml) in the presence of immobilized anti-CD3 Ab (5 μg/ml) for 3 days in the indicated cell numbers per well. The cytotoxicity against Jurkat cells (5 × 103 target cells/ml) was determined by a 4-h 51Cr release assay. The left panel shows data representing one of three similar experiments; the right panel shows the mean ± SE from three experiments. Since IHLs are a mixed population that include not only conventional T cells but also NK-T, NK, and Kupffer cells, we subsequently investigated which cell populations were responsible for the IL-18-enhanced cytotoxicity. NK-T, NK, or conventional T cells were sorted by FACS, and the purity of each population was always >98% (data not shown). We initially tested whether conventional T cells in the liver were cytotoxic and whether their cytotoxicity was regulated by IL-18. Therefore, conventional T cells in the liver were tested for their cytotoxicity just as IHLs were tested. None of the T cells from B6 (Fig. 2⇓A), gld, or perforin-deficient mice (data not shown) showed any killing activity against Jurkat cells, regardless of whether IL-18 was added. In contrast, IL-18 significantly augmented the cytotoxicity of spleen TCRαβ+ T cells that had been stimulated in the same way (Fig. 2⇓B). This result indicates that anti-CD3-stimulated liver T cells are not cytotoxic, and no cytotoxicity was induced in these cells by costimulation with IL-18. Effect of IL-18 on the cytotoxicity of conventional T cells. A, Conventional T cells from B6 mice were purified from total IHLs by FACS, and the cytotoxicity of the cells was determined as described in Figure 1⇑. The left panel shows data representing one of three similar experiments; the right panel shows the mean ± SE from three experiments. B, Spleen TCRαβ T cells were stimulated with or without IL-18 (50 ng/ml) in the presence of immobilized anti-CD3 Ab (5 μg/ml) for 3 days before the cytotoxicity was assayed. Data represent the mean ± SD from six wells. NK-T cells are present at a high frequency in the liver; these cells may exert their function in such a specialized location. Therefore, we examined this population as effectors of cytotoxicity. As shown in Figure 3⇓A, NK-T cells from B6 mice did not show any cytotoxicity when stimulated with anti-CD3 Ab alone; however, a strong cytotoxicity was induced when the cells were costimulated with IL-18. We observed similar results in NK-T cells from gld mice (Fig. 3⇓B), suggesting that the IL-18-induced cytotoxicity of liver NK-T cells is not CD95-dependent. To test whether this cytotoxic effect was mediated by perforin, the same experiment was performed using NK-T cells from perforin-deficient mice. However, no cytotoxicity was observed in NK-T cells from this strain, regardless of whether IL-18 was added (Fig. 3⇓C). This result shows that perforin is required for the cytotoxicity of NK-T cells that have been stimulated by IL-18. Similar results were obtained using the classic NK target, YAC-1 (data not shown). Since obtaining sufficient NK-T cells from young mice (8 wk old) was very difficult, especially from the perforin-deficient mice, we were unable to perform the cytotoxicity assay at the same number in the starting cultures of effector cells from each strain. However, our results strongly suggest that liver NK-T cells develop perforin-mediated cytotoxicity in response to TCR ligation and IL-18 costimulation. We also tested whether IL-18 alone enhances the cytotoxicity of the liver NK-T cells from B6 mice, but no enhancing effect was found when cells were stimulated with IL-18 alone (data not shown). 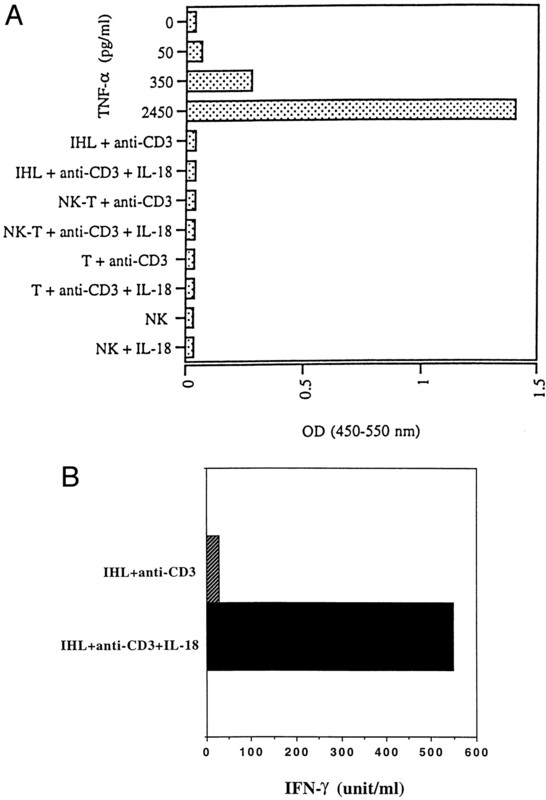 Augmentation of the cytotoxicity of NK-T cells by IL-18. Similar to the procedures described in Figure 2⇑, NK-T cells from B6 (A), gld (B), and perforin-deficient (C) mice were purified by FACS, and cytotoxicity was performed on Jurkat cells. The left panel shows data representing one of three similar experiments; the right panel shows the mean ± SE from three experiments. NK cells are also a highly cytotoxic population; their cytotoxicity can be up-regulated by certain cytokines, such as IL-2 and IL-12 (12, 13). Since these cells do not express a CD3-associated TCR, we tested the effect of IL-18 on these cells using a different protocol. As shown in Figure 4⇓A, NK cells from B6 mice that had been cultured alone for 2 days were not cytotoxic; however, these cells became highly cytotoxic when IL-18 was present in the cultures. This cytotoxic activity was absent when NK cells from gld mice were used (Fig. 4⇓B), showing that the cytotoxicity was CD95L-dependent. In parallel, we tested the role of perforin in NK cell cytotoxicity using NK cells from perforin-deficient mice. We could not observe any cytotoxic activity of NK cells from this strain, either constitutively or when stimulated with IL-18 (Fig. 4⇓C). The experiment was repeated three times with identical results. These data suggest that this form of IL-18-induced NK cell cytotoxicity depends upon both CD95 and perforin. However, according to all of the systems examined to date, CD95 and perforin function as independent killing mechanisms. Effect of IL-18 on the cytotoxicity of liver NK cells. NK cells from B6 (A), gld (B), and perforin-deficient (C) mice were purified by FACS and stimulated with or without IL-18 for 2 days. The cytotoxicity of the cells was determined as described in Figure 1⇑. The left panel shows data representing one of three similar experiments; the right panel shows the mean ± SE from three experiments. TNF-α has been shown to induce the apoptosis of peripheral CD8+ T cells in both in vitro and in vivo experiments. However, there is no information about the effect of TNF-α in intrahepatic cytotoxicity. To investigate whether TNF-α is a mediator for the killing activity in the liver, we examined the TNF-α production by IHL subpopulations, including NK-T cells, NK cells, T cells, and total IHLs, by ELISA. However, none of these cell populations from B6 mice produced any detectable TNF-α, nor was production induced by IL-18 (Fig. 5⇓A). The same results were also observed in gld and perforin-deficient mice (data not shown). As a positive control, we measured IFN-γ production from the same culture of IHLs from B6 mice. IFN-γ production was greatly enhanced by IL-18 (Fig. 5⇓B). Since no subset of IHLs produces TNF-α under the influence of TCR ligation plus IL-18 costimulation, we have concluded that soluble TNF-α was not a mediator of cytotoxicity in our experimental system. A, TNF-α production by IHL subpopulations from B6 mice. TNF-α production in the supernatant of 105 cells that had been stimulated with anti-CD3 Ab alone or in combination with IL-18 for 3 days was measured by ELISA for murine TNF-α. rTNF-α at indicated concentrations was used as a control. Each point was the mean of duplicate samples. Since the results were uniformly negative, positive controls for the assay have been included. B, IFN-γ production was measured from the same supernatant of IHL culture by ELISA for murine IFN-γ. Two recent studies have shown that both CD95- and TNF-mediated cell death contribute to the deletion of activated CD4+ T cells in lymphoid organs (8, 9). Our previous studies have shown that activated CD8+ T cells behave in a manner that is considerably different from that of CD4+ T cells. CD8+ T cells home to the liver, where they undergo apoptosis (4). To identify whether CD95 is also important for intrahepatic T cell deletion, we have crossed CD95-deficient mutant mice carrying the lpr/lpr genotype with TCR tg mice specific for SV40 T Ag to examine the effect of CD95 deficiency on CD8+ T cell deletion. Similar to that seen in lpr/+ mice, a dramatic hepatic accumulation and subsequent apoptosis were found in lpr/lpr animals, indicating that the CD8+ T cell deletion was not entirely CD95-dependent (W.Z.M. and I.N.C., manuscript in preparation). At present, it is not clear whether CD8+ T cells undergoing AICD receive a lethal signal in the periphery and are simply trapped by the liver, or whether the liver traps activated T cells and deletes them through an intrahepatic cytotoxic mechanism (19). To clarify the mechanism of intrahepatic T cell deletion, we first investigated whether an intrahepatic killing mechanism exists. In the present study, we used an in vitro system that enabled us to assess clearly the function of distinct cell populations in the liver and demonstrated that IL-18, a Kupffer cell cytokine, plays an important role by augmenting the cytotoxicity of IHL subpopulations via multiple effector mechanisms. Most interestingly, we found that IL-18 enhances the cytotoxicity of NK-T cells via a perforin-dependent pathway. NK-T cells are an unique population of T lymphocytes that coexpress intermediate levels of TCRαβ and NK1.1, which are markers of the NKR-P1 family. In contrast to the lymph node and spleen, in which there are only 1 to 2% of NK-T cells, the liver contains 30% of this population, suggesting that such cells may exert their functions in specialized locations (10, 11). However, the immunoregulatory function of this population, especially in the liver, is largely unknown. To date, it has been shown that thymic NK-T cells induce apoptosis in double-positive thymocytes via a CD95-dependent mechanism (20). It has also been shown that liver NK-T cells are potent effector cells against hepatic metastasis by killing tumor cells upon IL-12 administration, but the effector mechanism for this killing was not identified (15). In our experimental system, we found that NK-T cells acquire potent cytotoxicity upon TCR ligation and IL-18 costimulation; this cytotoxicity was mediated by perforin, a molecule that is also important in CTL- and NK cell-mediated cytotoxicity (21, 22, 23). Our result is the first evidence indicating that NK-T cell cytotoxicity is mediated by perforin. This observation provides new information with regard to understanding the molecular mechanism for NK-T cell cytotoxicity. In our experiments, stimulating the cells with immobilized anti-CD3 Ab alone did not induce any cytotoxicity. This lack of cytotoxicity may be due to insufficient numbers of effector cells, or because a signal through only anti-CD3 is not sufficient for activating the cells. We found that IL-18 can significantly activate NK-T cells in the presence of anti-CD3 Ab, showing not only the cytotoxicity but also a dramatic morphologic change (i.e., enlargement of the cell size), which is a feature of activated cells (our unpublished observations). These results show that IL-18 is a potent inducer of the cytotoxicity of NK-T cells. We believe that this cytotoxicity may play a major role in the intrahepatic killing of activated T cells. In addition to NK-T cells, IL-18 also augments the cytotoxicity of liver NK cells in B6 mice. NK cells are defined as a potent cytotoxic population against virus-infected cells and tumor cells (12, 24). The function of NK cells as an immunoregulatory cell has recently been reported. Arase et al. have shown that freshly isolated spleen NK cells expressing CD95L induce the death of CD95+ target cells (25). More recently, Tsutsui et al. have shown that IL-18 greatly enhances the CD95L expression and CD95L-mediated cytotoxicity on NK cell clones established from mouse liver (13). They also show that NK cell clones did not kill the YAC-1 cell line, which is a classic target for NK-mediated killing, even though they observed perforin expression in the cytoplasm. They suggest that, similar to CTLs, NK cells use only one of two distinct cytotoxic pathways, either the CD95L- or the perforin-mediated pathway. We found no cytotoxicity of NK cells from gld mice, suggesting that CD95L was the effector mechanism. However, NK cells from perforin-deficient mice also did not show any cytotoxicity, although CD95L should be intact in these animals. The requirement for CD95L and perforin for NK cell cytotoxicity was unexpected, but it is consistent with recent reports on the requirement of CD95L and perforin for the lysis of hepatocytes by CTL clones (26). The site of synergy between the Fas ligand- and perforin-induced cytotoxicity is currently under investigation. It is also possible that perforin gene expression is essential for NK cell maturation, with an impaired development of NK cells in perforin knockout mice. Regardless of the explanation, the data presented here confirm the observation of Tsutsui et al. that IL-18 enhances liver NK cell activity (13). We also used YAC-1 cells as targets (data not shown), but did not find any striking differences in YAC-1 sensitivity to the cytotoxicity by IHL subpopulations compared with Jurkat sensitivity. In particular, IHLs from perforin knockout mice were able to lyse YAC-1 cells. We also detected CD95 expression on the surface of YAC-1 (data not shown). Therefore, we conclude that YAC-1 cells are not a specific target for perforin-mediated cytotoxicity. Our results also demonstrated that Jurkat cells can be a sensitive target for perforin-mediated cytotoxicity. The expression of both CD95 and CD95L results in the suicidal or fratricidal cell death of activated T cells (8). However, conventional T cells from the liver did not show any cytotoxicity when stimulated with anti-CD3 Ab, and the cytotoxicity was also not induced by IL-18. This finding is surprising, because it is widely accepted that T cells are major effectors in CD95-dependent cell death in peripheral lymphoid organs (7). The absence of cytotoxity suggests that T cells are not a major cytotoxic effector in the liver; therefore, the fratricidal death mechanism is not a cause for the intrahepatic killing of activated T cells. Rather, other cell populations such as NK-T and NK cells form the majority of the cytotoxicity in the liver. This result is in support of our observation in an in vivo model that the CD95-signaling pathway was not a major mechanism for intrahepatic CD8+ T cell deletion (W.Z.M. and I.N.C., manuscript in preparation). Using TNF-α receptor (TNFR)-deficient mice, Zheng et al. have shown in an in vitro model that TNF-α is involved in the apoptosis of CD8+ T cells from lymph nodes (27). Subsequently, Speiser et al. have used an in vivo model with TNFR-p55-deficient mice to show that TNF is essential for the deletion of peripheral cytotoxic T cells (28). However, they did not assess the role of TNF-α in intrahepatic T cell deletion. In our experiments, we could not detect TNF-α production by any subpopulations of IHLs; therefore, we conclude that soluble TNF-α is not a mediator of the cytotoxicity mediated by NK-T, NK, or T cells in the liver. This conclusion suggests that the liver and peripheral lymphoid organs may use differential effector mechanisms for the deletion of activated T cells. We thank Dr. Haruki Okamura and Hayashibara Biochemical Laboratories, Japan for generously providing murine rIL-18 and Tom Taylor for expert cell sorting. We also thank the Liver Center at Yale University for technical support. ↵1 This work was supported by Grant 1R01 A1 from the National Institutes of Health. ↵2 Address correspondence and reprint requests to Dr. Tao Dao, Immunobiology Section, Yale University School of Medicine, New Haven, CT 06520. ↵3 Abbreviations used in this paper: AICD, activation-induced cell death; IHL, intrahepatic lymphocyte; tg, transgenic; CD95L, CD95 ligand; B6, C57BL/6; gld, C57BL/6.C3Hgld/gld.